On the surface, as a nonsurgical way to relieve pain and inflammation, epidural steroid injections seem like a great idea. However, when we dive beneath the surface, we find that epidural steroid side effects are pretty awful. I’ve observed many times, that for some patients, that while that first shot seems nothing short of miraculous, this pain relief is not only temporary, but it tends to diminish with each repeated epidural steroid injection. In conjunction with my brief video above, today we’ll look at my theory of why pain relief diminishes over time with repeated epidural steroid injections and what we can do about it. But first, let’s review some of their awful side effects. Epidural steroid injections have been associated with a 29% increase in spinal fracture risk, for each epidural shot, in middle-aged and older women due to bone loss. Another risk women assume with epidural steroid injections is vaginal bleeding after the procedure—this link also provides studies showing these shots can cause poor blood-sugar control in diabetics. Epidural steroid injections have also been shown to suppress the hypothalamus-pituitary-adrenal (HPA) axis, the brain loop that allows you to respond to stress and inflammation, with the effect lasting as much as three weeks after just one injection. Keep in mind, these injections are commonly performed every week for three weeks. This suppression effect can create problems with energy reserves, hormonal regulation, the nervous system, immune function, and increase susceptibility to illnesses. A similar effect was also found with steroids injected into knees, with a resulting 60% of subjects showing adrenal problems two months after their steroid injections. Steroid injections into knees are also associated with significant cartilage loss with no clinically significant improvement in pain. While our discussion today is on epidural steroid injections, oral steroids fare no better with links to bone loss and even osteonecrosis and failed joint replacements due to injections. If all of this isn’t enough, we’ve seen many studies simply showing these epidural steroid injections are providing less relief than the anesthetic alone, and today’s post may explain why. If you are someone who’s had a series of epidural steroid injections, you may have noted that while that first shot really helps relieve your pain, the second helps less and the third even less. Why is this? This likely happens because the high-dose corticosteroids used, and even many of the anesthetics used along with them, are toxic to local regenerative cells that help repair and maintain tissue. Let me explain further. 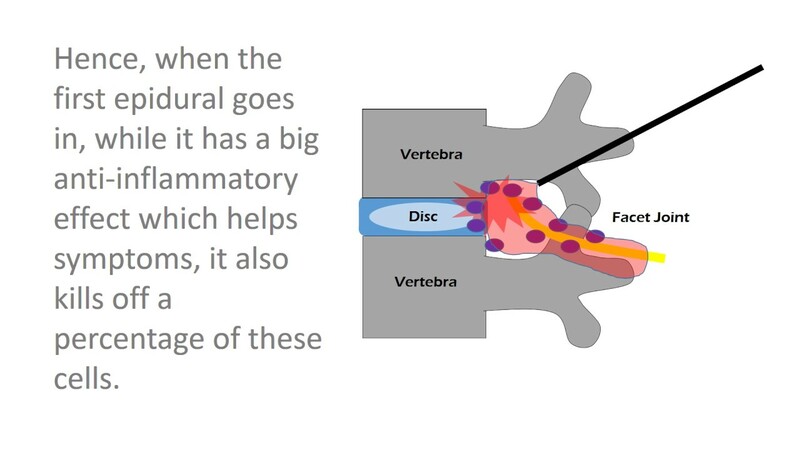 First epidural: It has a big anti-inflammatory effect, which helps the patient’s symptoms, but it also kills off a percentage of these cells. Second epidural: There is still an anti-inflammatory effect; however, there is less of a local maintenance and repair effect with fewer stem cells to work with. In addition, it kills off even more cells. Third epidural: It kills off the few remaining viable cells, so the patient experiences even less pain relief. To eliminate the toxic effects of epidural steroids as well as their diminishing pain relief, we can substitute a regenerative injection. A fourth-generation platelet lysate is a natural growth factor rich cocktail made from the patient’s body, and we’ve found better results when using this as opposed to epidural steroid injections. The upshot? While that first epidural steroid injection may give you a big punch of pain relief, don’t get too comfortable. In some patients, the pain relief is only temporary, and when it returns, the second and third shots provide less relief. So why not skip the toxic steroids? I wish I would have known this years ago! I've been shot so much, never being warned about the risk until recently, that if one shot made you glow a little bit, I'd be a CHRISTMAS TREE! I'm no longer so quick to get the "cocktail" injection. Thank you for the explanation and the informative video! No, a steroid injection, no matter how performed, would not give permanent relief.